Hamilton started off with “Save Me” a song from his newest and ninth album release What I'm Feelin', and you can feel the excitement and see the artistry this crooner has to offer. He was able to smoothly infuse a little Parliament or P-Funk into his 2003 single “Comin From Where I’m From” and paid tribute to the greats that paved the way for him. He covered crowd favorites like “Love Changes” by Mother’s Finest, Marvin Gaye’s “Sexual Healing, and paying respect to the legendary musician Prince, who recently passed away by singing one of his popular songs, “Adore”. If you’re on social media, you have probably come across videos of his backup singers, affectionately known as the Hamiltones, now famously known for covering hip-hop songs in their own Baptist church style of singing. While taking a short break, Anthony allowed them some time to perform their rendition of Drake’s “Hotline Bling” and “Respeck” a song they made up based off Cash Money Records founder Birdman’s interview with The Breakfast Club radio show. (The Hamiltones remind me of the deacons that stood in front of the church singing hymnals only using their hand clapping and foot stomping as the beat to accompany the soulfulness of their voices). Good times. There was a point during his performance when Anthony came on stage and took on a more solemn feeling, wearing a white shirt and sitting center stage under a spotlight, he performed “Still”, a more spiritual song from What I’m Feelin’, allowing the stage lighting to appropriately set the ambience. Once thing for sure, Anthony knows how to engage the audience, the crowd was grooving and singing along with him with ever hit he covered including “The Point of it All” and “Charlene”, he also gave the steppers a chance to do their thing once he sang “Best of Me’ from his 2011 album Back to Love. Addressing #BlackLivesMatter and police brutality, Hamilton performed “Soul’s On Fire” from his 2008 Point of it All album and incorporated police sirens and smoke effects to heighten the seriousness of this situation. Pleading at the end of the song to “Please, stop killing our babies”. Anthony Hamilton will never disappoint. His shows seem to only get better and his voice resonates throughout the venue dexterously. American Idol and Grammy winner soulstress, Fantasia, reminds me a lot of Patti Labelle and gospel legend Shirley Caesar. She wears her emotions on her sleeves and has no qualms about displaying the passion that seeps between the lyrics of some of her most heartfelt songs. Stepping on stage with a in a short black jumper kicked off her set with “Without Me” from her 2013 album Side Effects of You, she got the crowd up immediately, letting them know she came to set the standard. This song is definitely a shout out to an ex who basically tried to come up on her merits, and she had to let him know “faking shii will kill you, boy I know the real you”. Going into her next song there was some popping in the sound, and Tasia quickly alerted the sound guys that they “better get it right”. Fantasia, after going through her well documented bad relationship is now newly and happily married and is releasing a new album, The Definition Of, due out on June 10th, 2016. Her performance was a true testament of her journey, and while paying tribute to eighties by performing a medley of the jams by Tina Turner, Morris Day, Rick James, and of course Prince, she made sure to preview new songs and perform her hit singles like “I’m Doin’ Me” and “No Time For It”. I loved how she incorporated a snippet of my favorite MC, Nas’ song “If I Ruled the World” inviting crowd participation to sing the hook with her, but there are special moments throughout her performance that will stay with me. When singing her song “Lose to Win” from Side Effects of You you can feel how it touched a lot of the audience members as they swayed back and forth with her when she started to feel the emotions evoked by the lyrics of the song, even breaking down in tears near the end of the song. That’s passion. Allowing her backup vocalists, The Sugas, some time to showcase their talents, they did an acapella set of “Truth Is” and the harmonies were pitch perfect. Being that I’m a Columbus native, it was cool to know one of the singers hail from Cleveland, OH. Ending the show by walking down in the audience while telling security to “get out my way” Fantasia made sure to make good on her words she spoke earlier by not allowing fame to change her. Walking through the crowd, shaking hands, high-fiving, and singing down the aisles, she made a grand exit. One that I felt was short and was hoping there would be an encore, but there wasn’t. That was the show. 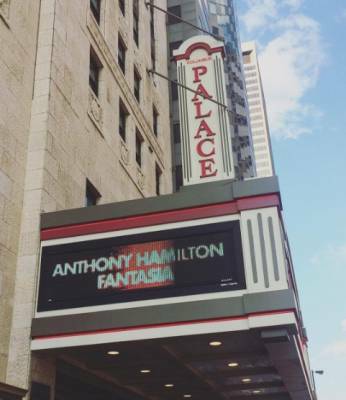 This was my first time seeing Fantasia but it won’t be my last. Her enthusiasm, showmanship, and passion are second to none. And how can I forget to mention the many faces she makes while singing, affectionately demonstrating the sentiments felt in each song. I also have to send a shout out to the band members for both performers; the bass players, keyboardists, vocalists, and drummers were all awesome sauce.